Today I have decided to keep the recipe of the week quick, easy and delicious. Lately I have been addicted to asparagus, no seriously, addicted. Last shopping trip I even caught my husband giving me a sideways glance as I picked up two bunches of asparagus after already eating three bunches earlier in the week. Blame it on pregnancy cravings or maybe just the fact that they have been plentiful and beautiful at the market, either way they are currently my go to vegetable. In the past 10 days we have had them roasted, sauteed and placed on top of a homemade whole wheat pizza crust with mushrooms and onions, roasted again to top a giant green salad and then lastly stir-fried up with leftover rice, veggies and tofu. I have to say I enjoyed them in each dish but my absolute favorite way to eat asparagus is oven roasted. When making these it is important to choose asparagus that are on the thinner side; they are going to be much tender and more enjoyable to eat. Preheat oven to 400F. 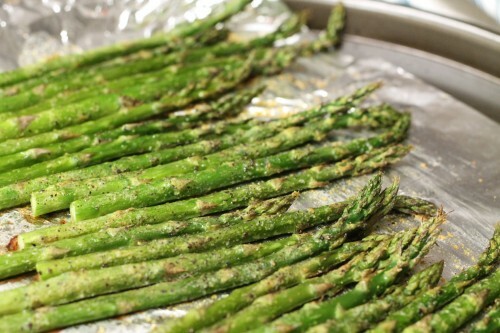 Toss the asparagus with the olive oil, nutritional yeast, salt and pepper. 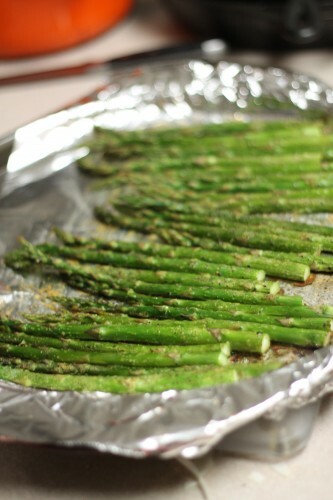 Spread the asparagus onto a large rimmed baking sheet in one layer. Place in the oven for 10-15 minutes until the spears start to brown and the stalks have softened. Now you can serve this with your favorite grain and protein, top a salad, put them in a wrap, eat them as as snack, the possibilities are almost endless. That’s exactly how I roast them, including the nooch! My favorite meal these days is to roast asparagus, tomatoes and mushroom, then cook quinoa, stir pesto into the quinoa, then mix in the vegetables. Mmm. I think I’ll make it for tomorrow night since we just bought five(!) bunches of asparagus yesterday. I LOVE asparagus, especially roasted or grilled! I’ve never tried nutritional yeast on it before though–I’ll definitely be giving that a try in the near future! I can only imagine how delicious it is! 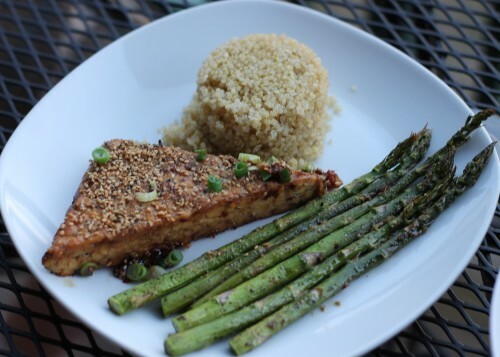 Yum – I love asparagus and I haven’t tried them with Nooch yet. We all know everything’s better with nooch, so great idea!